With the increase in telephone sales and inquiries in the UK, there has been a corresponding demand for new call centres. The Saga Call Centre at Folkestone, Kent, is a good example of the use of PVC fabric as an essential part of the design. This project in particular stands out because tensile fabric replaces the conventional suspended ceiling while also acting as a light reflector and on the sidewalls as an acoustic baffle. For Saga’s ceiling, large panels are attached to a pre-built sub-frame to produce an overlapping chevron effect. These frames, built off site, consist of PVC-coated glass fibre mesh (Satine) stretched onto lightweight steel frames. Recent UK legislation regarding percentages of reflected light in office buildings gave the designers the chance to use fabric to resolve the lighting problem without resorting to harsh direct illumination. One of the properties of PVC glass mesh is that it reflects light well. Due to the openness of the mesh, the light is softened, greatly reducing the glare usually associated with reflected light. 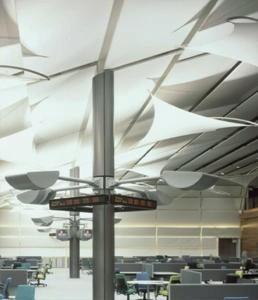 The combined effect of all the fabric structures is to reduce the perceived areas of the large flat wall and ceiling and to eliminate the echo usually associated with internal open spaces. The overall effect is very impressive, completely eliminating any harsh industrial feel to the space.